Who should pay to keep DC’s rivers clean? The tunnel boring machine that will dig a new underground tunnel to store sewage and stormwater runoff until it can be treated. Image by the author. 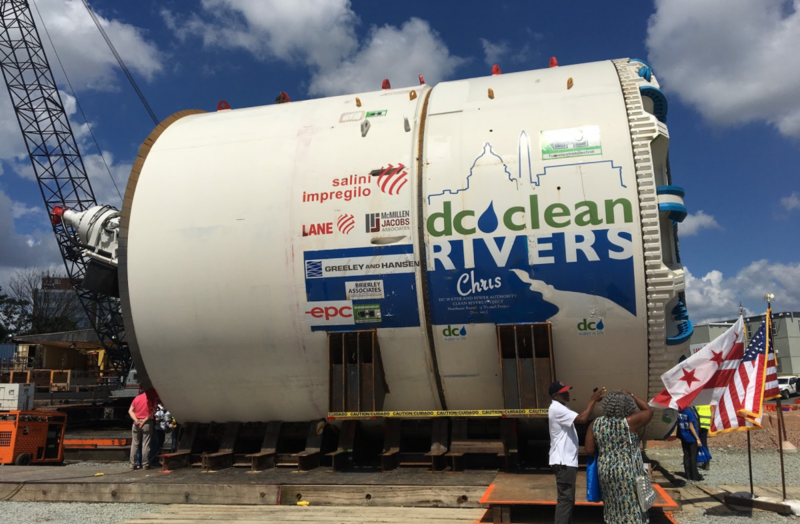 In June, DC’s water and sewer utility unveiled its new $30 million tunnel boring machine that will dig a five-mile underground tunnel to store stormwater runoff and raw sewage, preventing the contaminated mix from being dumped into the Anacostia River. It’s part of a multi-billion dollar project that is cleaning up local waterways — and also costing some nonprofit landowners like cemeteries and churches hundreds of thousands of dollars a year that they cannot always afford. The new tunnel, running from near RFK Stadium to R Street NW, is part of the $2.7 billion Clean Rivers Project, which resulted from a 2005 legal settlement. Five years earlier, environmental groups filed a lawsuit arguing that sending raw sewage into waterways violated the Clean Water Act. With the new system, the tunnels will store the sewage until it can be treated. To pay for the massive undertaking, DC Water in 2009 began charging its ratepayers for the amount of impervious surface on their land. The logic is that green spaces allow water to be absorbed into the ground. But impervious surfaces – like roofs, roads and parking lots – result in stormwater runoff, which DC’s sewer system combines with raw sewage that can end up in DC’s waterways. The fee – called the Clean Rivers Impervious Area Charge – was modest at first, starting at $1.24 per 1,000 square feet of impervious surface in 2009. The fee has risen steadily since, jumping to $25.18 this year. DC Water projects it will hit $45.99 in 2027. The DC Council and DC Water have approved $13 million in ratepayer relief for 2019, but there’s no long-term plan to address rising rates in 2020 and beyond. As NBC Washington (Channel 4) began reporting last fall, the impervious area charge hit some groups, like churches and cemeteries with limited budgets, particularly hard. St. Paul’s Rock Creek Episcopal Church in Northwest has an annual budget of $1 million for its cemetery, $200,000 of which goes to DC Water, a church leader testified before the DC Council last year. DC Water makes no difference between multi-billion dollar for-profit companies and local cemeteries, which maintain public green space and operate as nonprofits with public purposes. There are however differences. These companies are not paying an equivalent portion of their revenues to fund this project. Let me give you an example. Last year, the Washington Nationals paid about $209,000 in [impervious surface] fees, about what we’re paying. The difference is that the Nationals saw revenue of $304 million, compared to our $1 million in cemetery revenue. Mt. 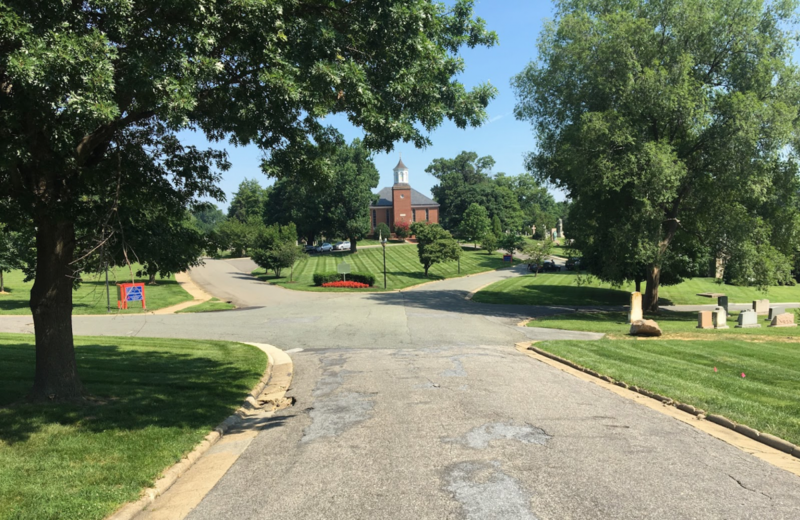 Olivet Cemetery near Ivy City pays more than $100,000 a year in impervious surface fees, according to Craig Muckle, public policy manager for the Catholic Archdiocese of Washington. Other Catholic churches have been hard hit as well, he said, with the four paying the highest fees all located east of the Anacostia River. “Ministries have been impacted, so we’re doing less community service work, in the church directly and externally. Staffing has been affected. We’ve had to take people who are full time and make them part time or let people go entirely,” Muckle said. Rev. Willie Wilson of Union Temple Baptist Church in Anacostia said the fees were among the contributing factors in several churches closing or relocating to Maryland. St. Paul’s Rock Creek Cemetery has miles of impervious roadway and acres of green space. Image by the author. Cecily Thorne, operations director at the 86-acre St. Paul’s Rock Creek Cemetery, says impervious surface area does not accurately measure stormwater runoff. DC Water says it’s a zero sum game. With a federal court order and a $2.7 billion price tag, reducing the fee for some means increasing it for others. Faith leaders say DC and the federal government should pay the impervious surface fee for roads, sidewalks and alleys, which are currently exempt. “The streets that you drive on and the sidewalks you walk on to get to places – like churches – are exempt, but once you get on church property, those folks are paying,” Muckle said. DC Water’s then-interim General Manager Henderson Brown wrote in a February letter to DC Councilmember Mary Cheh that District and federal rights of way make up 38% to 40% of DC’s impervious area. If their exemption were ended, DC would owe $41 million and and the federal government would owe $5 million. According to Brown’s letter, that money could pay for a 40% reduction in the fee, from $23.00 per 1,000 square feet of impervious surface at 2019 rates to $13.77. Cheh chairs the DC Council’s Transportation and Environment Committee, which has oversight of DC Water. She indicated support for charging the Clean Rivers Impervious Area Charge (CRIAC) to DC and the federal government for their roads and sidewalks. “[It] would enable a decrease of about 40% to every ratepayer’s CRIAC fee if applied evenly across all ratepayers. I think this is a worthwhile investment to ease the burden of the CRIAC on ratepayers,” she said. DC Water has the authority to start charging the impervious area fee to the DC government and the federal government for their roads and sidewalks. But sources from DC Water and the DC Council say DC Water would likely assess the fee only if the DC Council agreed to come up with the money. 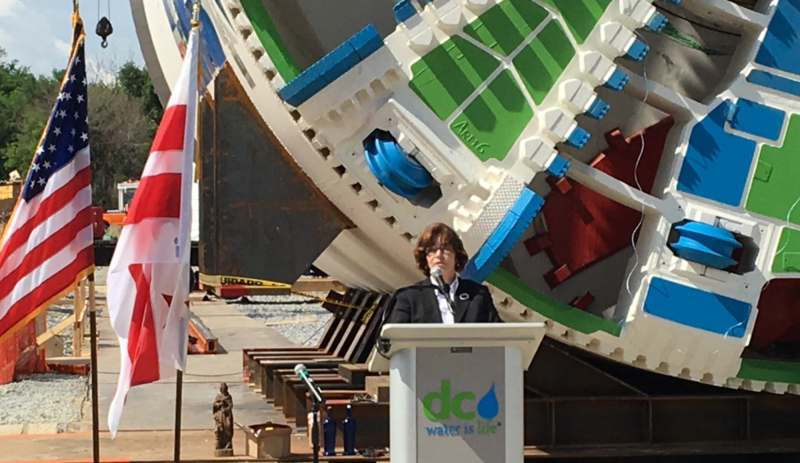 DC Councilmember Mary Cheh, chair of the Transportation and Environment Committee, speaking at the dedication ceremony for DC Water’s new tunnel boring machine. Image by the author. Muckle says it’s unfair to assess the fee based on stormwater runoff while not increasing DC Water’s sewage rates by a similar amount, because sending sewage, not rainwater, into DC waterways is the problem. But it’s stormwater runoff during heavy rain that causes the system to be overloaded and send the stormwater/sewage mix into the rivers. “The stormwater does push it over the top, we readily acknowledge that,” he said. Still, he argues, sewage rates should rise along with the impervious surface fee. On July 5, DC Water’s board voted to spend an extra $6 million in 2019 for fee relief for low-income residents struggling with their water bills. “We will continue to work in partnership with the mayor and Council to reduce the impact of future rate increases on low-income customers,” said DC Water spokesperson John Lisle. Given that we don’t know how many non-profits will apply for hardship relief, it is too early to say whether $4 million will be a sufficient investment. That said, I am concerned that the funding is currently only one-time. The CRIAC is going to continue to increase until at least 2026, and we need a long-term, sustainable solution to the burden that the CRIAC is putting on DC Water ratepayers in the District. I consider the $7 million in the FY 2019 budget a good start, but I plan to continue working with the mayor and my fellow councilmembers over the next year to develop a long-term solution to this problem. In a letter to DC Water earlier this year, Cheh suggested other measures, such as giving customers credit for preserving green space, offering greater fee reductions for reducing impervious surfaces and basing the fee on actual stormwater runoff rather than impervious area. But she acknowledged the ideas could be difficult to implement. Though faith leaders say many religious institutions struggle to pay the fee, they acknowledge that sending sewage into DC’s rivers is unacceptable and that the solution will be expensive. Rev. Bobby Livingston, senior pastor of Mt. Bethel Baptist Church in Bloomingdale, said problems with DC’s antiquated sewage system cost his church thousands of dollars in a 2001 flood after seven inches of rain fell in one hour. It wasn’t just churches damaged by flooding and sewage in Bloomingdale. A heavy storm in 2012 resulted in roads and row houses flooding. With the sewer system overloaded, raw sewage spewed out of toilets and into homes. To stop the flooding and sewage issues in Bloomingdale, DC Water in 2016 completed the first phase of the Clean Rivers Project, with a half-mile tunnel under 1st Street NW. Since the tunnel opened two years ago, there’s been no flooding or sewage backups. 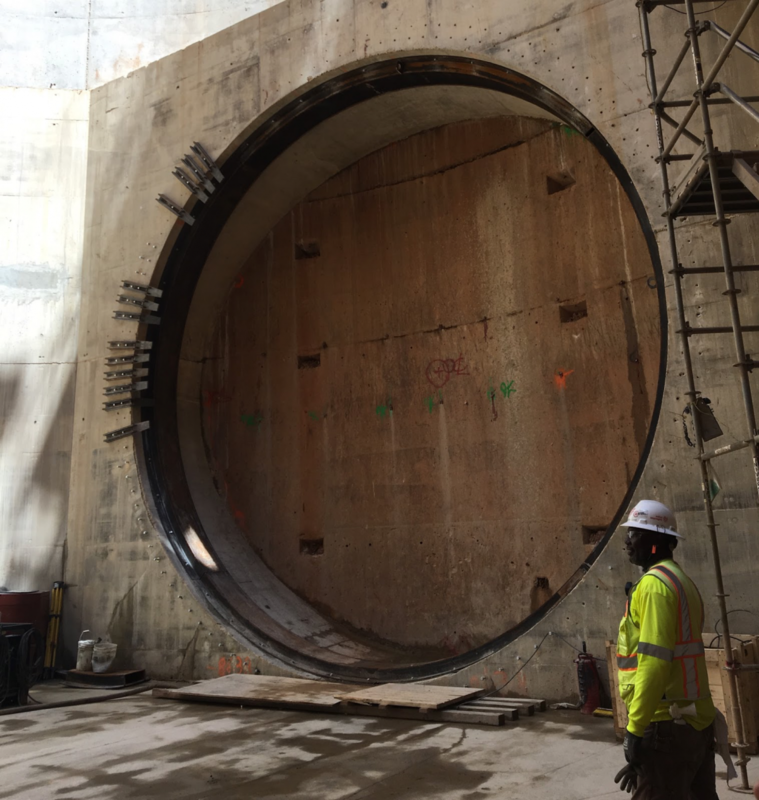 DC Water’s sewage-storing tunnels range in diameter from 18 to 23 feet and will total 18 miles when complete. Image by the author. Why does DC combine rainwater and sewage? DC’s sewer system was state-of-the-art when it was built – in the 1870s. Called “combined sewer overflow,” the system takes anything that ends up in toilets, sinks, showers and storm drains and sends the refuse to be treated at DC Water’s Blue Plains Advanced Wastewater Treatment Plant on the southern tip of DC, near the Woodrow Wilson Bridge. After trash, toxins, and biosolids are removed, the remaining liquid is cleaned and released into the Potomac River. But during periods of heavy rain, DC Water’s treatment facility is overwhelmed by the volume of the combined sewer overflow and cannot treat it all. When that happens, the system is designed to send the messy mix into the rivers rather than back into people’s homes. In March, a seven-mile stretch of tunnels from RFK Stadium to the Blue Plains wastewater treatment facility went into operation. DC Water reports that in the first three months, it has prevented 107 tons of trash and 1.4 billion gallons of combined sewage from entering the Anacostia River. When the entire 18-mile system is complete in 2030, it will divert 98% of combined sewage overflows from the Anacostia River and 96% of all overflows, according to DC Water. Funded with a variety of bonds, some maturing over 30 years and others over 100 years, the District of Columbia has decades of payments ahead – and potentially decades of arguments over who should pay.